Last month I presented historical returns following days when there was a strong reaction (+1%) to a Fed (pictured at right) announcement. The results showed that the positive reaction was typically short-lived. Another highly anticipated Fed announcement is due tomorrow. Tonight I thought I’d present historical returns following a disappointment (just in case). As you can see, a strongly negative reaction to a Fed announcement has typically been followed by a very positive next two weeks. So…if the Fed does something the market “likes” it will go up tomorrow, but over the next two weeks returns will likely be disappointing. If the Fed disappoints the market tomorrow we’ll see afternoon weakness. This disappointment could lead to a nice rise over the next two weeks. So the bulls should want the Fed to upset them tomorrow, and the bears should hope for a short-covering rally. I find these tendencies to be quite interesting. My untested (as of yet) theory on why this occurs is that “good” news normally will come in the form of a rate cut or other stimulus. This kind of good news happens during times of economic and market weakness and the improvement for both can take time. “Bad” or “disappointing” news many times will come in the form of tightening. The Fed tightens normally when the economy and markets are strong. Just as they can’t fix it in a day, they can’t break it in a day either. Their “bad” decision won’t derail a rally right away and the market will typically continue to trudge higher for a while. Whatever the reason, the point to remember is this: Don’t get too caught up in the reaction to the Fed tomorrow. The move likely won’t last longer than a day or two before reversing itself. Edit note: Test was run back to 1982. For those who would like to review the previous instances they were 6/2/94, 11/6/00, 11/13/01, 10/28/02, 11/29/02. You don’t want to read too much into just 5 instances, but the formation has been quite bearish in the past. Of course as I mentioned last night, the Fed announcement Wednesday will likely have a larger influence on short-term direction than historical precedents. I’ve previously discussed some of the findings in Larry Connors’ book “How Markets Really Work”. In the book Larry looks at certain market situations and determines whether the market has historically outperformed or underperformed when those situations arose. One I previously discussed was a 3-day rise in the market when it is trading under its 200-day moving average. Historically, the market has struggled to add further gains after this has occurred. Another edge Larry discusses in his book is performance following a 10-day high. In the book he shows there has been a negative expectancy over the next 1-5 days following a 10-day high. I have personally examined 10-day closing highs and found a negative expectancy 3-5 days out when the market is under its 200-day moving average. When it is over the 200-day the expectancy is no longer negative. A negative expectancy persisted up through 12-days out. The greatest part of it appeared in the 1st three days. Of course during the next three days there is going to be a Fed announcement. The reaction to that may have a larger affect on market movement than my little test. Still, it’s worthwhile noting the negative expectancy in these situations. Below is a chart showing all the recent instances with a 3-day exit strategy. Are The Leaders Suggesting A Market Meltdown Or A Sector Rotation? While the major indices faired well on Thursday, the IBD 100 got whacked. Only 28 stocks rose and the Index declined over 2%. (Hat tip to IBDIndex.) I noticed this has been an especially bad week for the IBD 100. While the S&P 500 is only down 2 points the IBD 100 is lower by almost 3.5%. The IBD 100 is a group of 100 stocks compiled by Investors Business Daily that represent market leadership. Unlike more traditional indexes, it is updated weekly and turnover on the list is quite high. Since it is supposed to represent current market leadership, I was curious to see if the strong underperformance so far this week would be significant if the major indices actually managed to close positive. In other words, in a generally rising market, does a breakdown in leadership signify sector rotation, or is it a sign that the indices will soon follow the leaders south? I looked back at weekly data to 3/12/2004, which is all I had available for the IBD 100. There have only been 3 times when the IBD has lost as much as 3% while the S&P has managed to finish the week positive. They were 3/10/06, 7/21/06, and 3/21/08. Below is a chart of all the instances where the S&P has had a positive week and the IBD 100 has dropped at least 1%. I’ll let you draw your own conclusions, but I’m having trouble finding anything that would suggest a meltdown is imminent. It appears the next 3-4 weeks have often been positive following these instances. Note: If anyone has or knows where I could find the daily IBD 100 Index values going back to its inception in 2003, please let me know. Thanks. The price action on Wednesday was quite interesting from an intraday perspective. I've posted a chart of SPY below. What sticks out to me it the fact that there were two extreme price moves in close proximity of one another. The chart is a five minute chart, which is the intraday chart I look at most often. Notice the two arrows with notes attached. When you get a strong and steady move like was seen from 10:10 to 10:55 or in the opposite direction from 11:55 to 12:25, one indication that it may be nearing its end is if a large range bar is posted. To help illustrate this concept I ran some historical studies. The first one looks to sell short any time there have been at least 6 up closes and the most recent bar makes the largest rise of any bar in the move. It then sells “X” bars later or at 4:00 – whichever comes sooner. No trades are taken before 9:50. As you can see, selling into this extreme move has a positive expectancy from 5-50 minutes out. The second study looks at exactly the opposite formation. It buys the SPY any time there have been at least 6 down closes and the most recent bar makes the largest decline of any bar in the move. It then covers “X” bars later or at 4:00 – whichever comes sooner. No trades are taken before 9:50. Again you can see that the edge is for a counter-move rather than a continuation for at least the next 5-50 minutes. The large bar after the steady trend many times signals a blowoff. It can be a good place to take profits if you are in a trade, or perhaps begin to look for a reversal. This is not a daytrading system by any stretch, but it does illustrate a concept that daytraders may want to keep in mind. With little notable action today I thought I’d write up the next part of my study on gaps during uptrends vs. downtrends. Last week I looked at mid-sized gaps up. Tonight I will look at mid-sized gaps down. As a refresher, a mid-sized gap is defined as a an opening between o.25% and 0.75% away from yesterdays close. A long-term uptrned is defined as a close above the 200-day moving average and a long-term downtrend is defined as a close below the 200-day moving average. I looked at 3631 trading days going back to 11/17/93. Of those there were 368 mid-sized gaps down in uptrends and 222 mid-sized gaps down in downtrends. Buying at the open and selling at the close when the market was in a downtrend would have been profitable 98 (44%) times and LOST you almost 32% over 222 trades. Per trade that’s about a 0.14% loss on average from open to close. Of those mid-sized gaps down, 152 (68.5%) filled at some point during the day. I previously showed that large gaps down in downtrends typically represented an intraday buying opportunity as they had a large positive expectancy. Mid-sized gaps do not act the same at all. They contain a negative expectancy. Interestingly, although a good percentage of them fill, they also generally fail. Fading the open could be one play. Another could be looking for a short entry after the gap fills. As I said last week, make sure you take the following two things into account when deciding how to approach a gap opening: 1) Long-term trend of the market. 2) The size of the gap. They both matter. Edit note: SPY was used for the above test. When looking at the market statistics today, the one thing that really stood out was the complete lack of volume. The exchange market volume was nearly the lowest of the year. The SPY and QQQQ volume WAS the lowest of the year. Back in March I busted the old “light volume pullback after a short-term runup signals a healthy consolidation” myth. Today I’ll look at it a little bit differently. Only 2 conditions – 1) Today’s volume is the lightest in at least 20 days, and 2) the market is trading above its 10-day moving average. I don’t care whether the market is pulling back or not for this test. I only care if we see exceptionally light volume during a short-term uptrend. It appears buying interest is drying up. In the past the market has not fared well under these conditions. Some may point out that these results differ greatly from the breadth study I showed yesterday. It appears breadth and volume are currently giving opposite indications. Studies that conflict make analysis more difficult. In the Subscriber Letter each night I discuss my take on all the recent studies. In the blog in the near future I will write some detailed thoughts on how I go about doing this. These results appear strongly favorable. The average week over the sample period returned 0.175%. The results above beat the average by more than 3 to 1 from 1 to 4 weeks out. Last week's action appears quite bullish. Tonight…some indicator analysis. I think many times traders focus too much on pattern recognition and therefore only look at price. This is especially true of intraday traders. Looking at price and price-based indicators is like looking at the Grand Canyon on a black and white TV. You can see it, but throw in volume and maybe you’ll get some color. Breadth could get you HD. Sentiment gives you surround sound. Add some intermarket analysis like Dr. Steenbarger employs and some historical studies like I prefer and you might actually get to view it for real. Tonight I’m going to look at breadth. Many traders look at breadth measures like the Advance/Decline line or the McClellan Oscillator on an end-of-day basis. But let’s examine whether intraday breadth analysis can lend some value. I ran a test back to April of 2001 looking at 15 minute bars in the SPY, the NYSE Advancing Issues and the NYSE Declining Issues. I wanted to see if strong or weak breadth in the morning led to price strength or weakness throughout the rest of the day. The rules for this test were fairly simple. If advancers led decliners by 4-1 at 9:45, then I would buy the SPY and sell it at 4pm. If decliners led advancers by 4-1 at 9:45 then I would short the SPY and cover it at 4pm. In general, strong advance/decline numbers in the early morning show a mildly positive expectancy in the SPY for the rest of the day while weak a/d numbers show a mildly negative expectancy for the rest of the day. Traders may benefit from tracking early morning breadth statistics. While this is certainly not something you would want to trade on its own, it may help to confirm or filter trades you are considering. Using breadth in conjunction with price and other kinds of analysis can make for a potent combination. For those who would like to explore this concept more it is available for purchase and download in Tradestation format here. The study comes with flexible inputs to adjust times and breadth requirements. A pre-set workspace is also included. Results here are quite negative. Here results were more mixed with the max loss accounting for all of the losses in most time periods. I also looked to see how often the gap up got filled when the market was trading below its 200 day moving average. For the Nasdaq 55% of the time the gap was filled within 5 days and 74% of the time within 10 days. For the S&P the results again were not nearly as negative. Only 41% were filled within 5 days and 55% within 10 days. A partial retracement of today’s move at some point seems likely. It may or may not be a few days before that begins, though. After the close today, Intel had a good report. Everyone seems happy (unless you’re short Intel.) The Nasdaq futures are juiced and the S&P’s are even up quite a bit as I write this. We stand a good chance of seeing a gap up tomorrow morning. There are some economic reports to deal with before the opening bell so things can clearly change, but it seems like a good idea to expect we may gap in the morning and to plan for it. Previously I’ve looked at large gaps up as well as large gaps down, and how the market reacted to them in both uptrends and downtrends. Today I will look at mid-sized gaps up. As a reminder I previously defined a large gap as one over 0.75% for the SPY. The mid-sized gaps I’m looking at tonight are gaps between 0.25% and 0.75%. Once again I will break the results out between mid-sized gaps up in uptrends and mid-sized gaps up in downtrends. You’ll find the results to be quite different from both each other and the large gap studies. For uptrend vs. downtrend I kept it simple and used the same definition as last time. If the market closes above its 200-day simple moving average, it’s in an uptrend. If the market closes below it, then it’s in a downtrend. I looked at 3626 trading days going back to 11/17/93. Of those there were 613 mid-sized gaps up in uptrends and 223 mid-sized gaps up in downtrends. Buying at the open and selling at the close when the market was in a downtrend would have been profitable 54% of the time. In total, though this strategy would have LOST you almost 66% over 223 trades. Per trade that’s close to a 0.3% loss on average from open to close. Of those mid-sized gaps up, 165 (73%) filled at some point during the day. Even with a slightly higher winning percentage these stats are significantly worse than those above dealing with uptrends. We previously found that large gaps up typically lead to more upside during a downtrend. Most likely this is because shorts get trapped and the market runs as they scramble to cover. Mid-sized gaps are a different animal. They are not as scary for the shorts. Shorts may even see it as an opportunity to add more exposure, while longs look to take gift profits. Whatever the reason, the long-tem downtrend is generally able to re-assert itself during the day and those that bought into the early morning excitement get punished. When deciding how to approach a gap up in the morning, make sure you consider at least two things: 1) Long-term trend of the market. 2) The size of the gap. They both matter. In the 1980’s Tony Crabel published research on Wide Range Bars and Narrow Range Bars. He introduced the concept of WR7’s and NR7’s. A WR7 is a bar whose range is wider then the previous 6 bars. An NR7 is a bar whose daily range is narrower than the previous 6 days. Others have done work with WR and NR bars since then including Linda Bradford Raschke and Larry Connors – both separately and together. Their book Street Smarts contains a pattern which uses historical volatility and NR4 bars to look for explosive moves. It appears the inability of the sellers to follow-through after the wide range day down invites buying over the next several days. In the very-short term (1-3 days) the bias is strongly bullish. Consider the fact that the average day over the period tested was a 0.06% gain. The one day performance following this setup was over 10-times a normal day and over three days it outperformed and average three days by over 5-times. The high win rate and average win size consistently higher than the average loss make this setup intriguing. A few other notes: 1) Whether the NR7 day was positive or negative had little impact on performance and was not differentiated in the results above. 2) A WR7 up bar is a less bullish setup – but I’ll look at that in more detail when the time is appropriate. Q: If a rooster lays an egg right at the very peak of the roof of the barn while facing north and the roof slopes east and west, which way will the egg roll? A: It won’t. Roosters don’t lay eggs. Q: If the S&P shoots up 2.5% or more in one day and then closes within 0.5% of its closing price the next five days in a row, which way will the market break? A: The S&P doesn’t do that…until now. Here’s a line chart of the S&P 500. I see no short-term edge. In other news, Alcoa (AA) released earnings Monday night. They disappointed and sold off a little bit on Tuesday. Alcoa’s earnings release always comes with great fanfare because it’s typically the first large-cap to report after the end of the quarter. Does it really deserve all the fanfare? Is it somehow predictive of how the market may perform during earnings season? I figured it was worth a look. From this limited test it appears the reaction to Alcoa’s earnings is about as important to the market as scoring first is in a basketball game. What's a trader to do when they can't identify a clear edge in their timeframe/market? Some thoughts on what to do between trades from Dr. Steenbarger might help. A little delayed I’ve posted below some statistics for the first month plus of the Subscriber Letter. March was a terrific month for the Letter. Note - this is not a performance record. I do not make recommendations in the Subscriber Letter. This is simply a listing of trade ideas. Past performance is not necessarily indicative of future results. March may turn out to be the best month ever. First, some trades ideas are scaled in to. Therefore you may see more than one position in the same security on at the same time. If the method calls for scaling in, it is most commonly done in up to 3 parts. Subscribers also receive intraday updates on many open trade ideas. The intraday updates are not reflected in the overall statistics. For instance, I sent out an update on the XLV and PPH trades above on the morning of 3/7 when they gapped up. It indicated that certain targets had been reached and traders could consider exiting these trades prior to the Monday open when the “official” exit prices would be determined. Both trades were profitable at the time of the update. 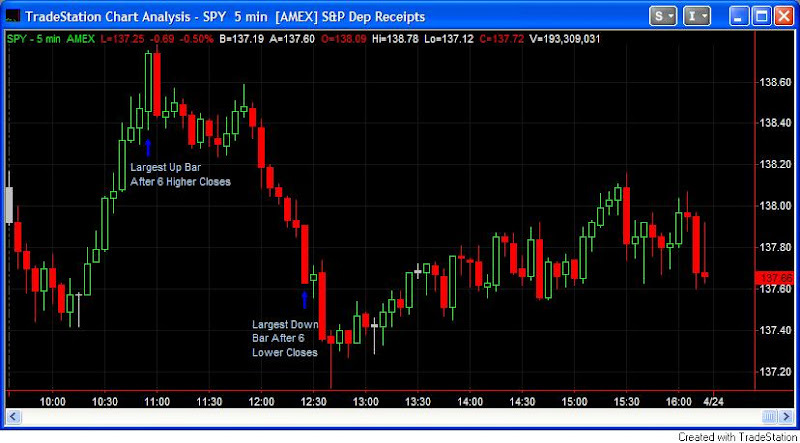 A similar scenario occurred with a few stock trades during March as well, where late-day selloffs and gaps down caused hits to the official stats, while many subscribers were able to fare much better. Those interested in checking out the Letter in more detail may shoot an email to QuantEdges@HannaCapital.com and receive 3 free issues. Just include your name and email address. Choppy trading over the next day or two has led to a downside edge once the market is 3-5 days out from these bars. Combined with the low VIX and the overbought readings of some indicators, caution seems warranted here. If the VXO spikes higher and the market doesn't rebound...look out below! Some kinds of reversal bars really do work. And so do others. When time gets stretched, price reversals are typically close at hand. When the Nasdaq and Russell get disjointed it typically means volatility and rising prices. Large gaps in downtrends should be bought. Both down and up. (Not included in package - done mostly outside of Tradestation). Big Arms can lead to next day buying. Inside Days have a tendency to lead to short-term downside. Some contracting ranges suggest more upside. 3 up days in a downtrend tend to lead to selling. Failed gaps aren't as bad as they seem. Triangle breakouts are highly unreliable and may provide an edge to fade. A late surge may or may not carry over to the next day. Not all breakouts are good. Nasdaq Leadership can be important. There is a recent edge on the 1st trading day of the month. Four months lower doesn't mean we're going up. More proof reversal bars work. Put/call ratios can help signal a reversal is near. Stretched VXO readings are generally a short-term positive for the market. New low divergences are nice but not overly positive. Strong moves off bottoms can lead to intermediate-term rallies. Sharply declining consumer sentiment tends to precede stock market lows. Fed rallies tend to be short-lived. Overbought in a downtrend can lead to some nice shorts. Light volume on a pullback isn't necessarily positive. The market doesn't get marked up on the last day of the quarter. In all, there are 45 studies included in the Quantifiable Edges 1st Quarter package. At a time when programmers charge $100 - $150/hr, I’m offering the entire package for $195. That’s about $4.33 per study. All open coded. Flexible inputs for further research. Ready-to-import data files for those studies that need it (like the Consumer Sentiment Index study). If you want to test you own ideas in Tradestation, this group of studies can also provide some nice templates to work with. Click here to purchase and you can download and import the studies and workspaces into Tradestation in just a few minutes.